16) Juxta Phona + Offthesky | !Escape Kit! Swedish keyboardist, composer and member of the legendary group Samla Mammas Manna has died at the age of 60. Nick Luscombe presents a regular update on the best new electronic music from around the world. taintradio.org is an international alliance of independent producers dedicated to presenting music and music-related programming on the Internet 24/7. There is no particular music format. Each program host is autonomous and presents only the music they wish to present. Our target audience is anyone who enjoys an eclectic and adventurous mix of music. Fresh Sound-New Talent esteemed jazz label Fresh Sound-New Talent is profiled at All About Jazz. club transmediale (CTM), Berlin’s unique festival for electronic and experimental musical culture, invites you to its 10th Anniversary Edition in January 2009.
nice collection of links: Music.populair.eu - Where do you get all that new cool hot music from? The 7th full-length album from Indonesia/Canada based experimental / progressive artist Kekal will be the first NePlusUltra Music release. Norway's THE KONSORTIUM has inked a two-album deal with Agonia Records. The band's full-length debut is due before the end of 2009. According to a press release, THE KONSORTIUM performs "black metal with various thrash, avant-garde and non-metal influences creating [its] own atmosphere and identity. THE KONSORTIUM features various members. Some of them better and some of them [not as well] known to the metal (but not only) community." Ex-Electribe 101 front woman Billie Ray Martin has started work on her new solo album. "Dream, Tiresias! ", the new album from Germany's Project Pitchfork, will be released on February 27 2009 on the band's own label Candyland Entertainment. Adrien Begrand: The Best Metal Albums of 2008 & PopMatters Picks: The Best Music of 2008 | PopMatters also his personal list @ The Best Albums of 2008. The 22nd Annual fRoots Critics Poll is the definitive look at the best albums of the year in world folk & roots musics. We badgered an international panel of more than 300 and this year’s winners are… Jim Moray’s Low Culture and Franco’s Francophonic. The Quietus isn't just about stern power ambient and arboreal black metal. To prove this we invited writers and pals to share their best-of-lists. IndieLondon: Best albums of 2008 - Your London Reviews - a most divergent list in terms of quality ! Muzikalia: Acclaimed Music Forum: Muzikalia Best of 2008 - Spanish web-zine has just published their end of year list as "Los mejores de 2008 en MZK". 25. Danny! / And I Love H.E.R. Zavvi: was formed after a management buy out of the Virgin Megastore division of the Virgin Group in September 2007.
breaking news: BBC NEWS | Business | Zavvi placed into administration - the main problem when your distribution partner [Entertainment UK] goes into administration - your supply chain is completely destroyed and so the saying "don't put all your eggs into one basket" becomes a business reality. Music, games and DVD chain Zavvi has gone into administration, Ernst & Young has announced, threatening 3,500 jobs. progressive rock, fusion jazz, world music, electronica, and much more. anywhere over the web at www.cflx.qc. ca. is currently in its 13th year on CFLX 95.5 FM Sherbrooke (Quebec, Canada). THE 2008 REVIEW | themilkfactory - also see individual lists at the end of the feature. Readers Best Albums of 2008 - why didn't prefix wait till January 1st to publish this? 4.) British Sea Power: Do You Like Rock Music? Finnish atmospheric and melodic death/doom metal band ABLAZE IN HATRED has completed work on its second album, "The Quietude Plains"
EXCLUSIVE: Bat For Lashes returns on April 6th with a new album Two Suns, PS can reveal. Produced by Natasha Khan with David Kosten, aka Faultline. Also Scott Walker and Yeasayer are guests on the album ! Fabric will release Commix's Fabriclive 44 in the UK on February 2 and in the US on March 10. Warp will release Harmonic 313's When Machines exceed Human Intelligence on February 3, 2009. Pianist Aaron Parks brings an alt-rock attitude to his Blue Note debut. Progressive rock band Satellite have revealed the cover artwork of their forthcoming album, Nostalgia. The artwork was designed by the young artist Trine. Nostalgia, the follow up to the highly acclaimed album Into The Night, will be released by Metal Mind Productions on 23rd February 2009 in Europe / 10th March 2009 in USA (via MVD). Wojtek Szadkowski, a highly acclaimed musician (Collage, Peter Pan) and a leader of one of the art/prog rock bands - Satellite, returns with a new fascinating project - Strawberry Fields. The band's debut album entitled Rivers Gone Dry will be released by Metal Mind Productions on 26th January 2009 in Europe and 10th March 2009 in USA (via MVD). Gomma will release WhoMadeWho's The Plot on March 2, 2009. As published in the new double issue of Kerrang - Magazine - on sale in the UK today. Sure, that's an annual cliché, but in 2008 it seems more apt than ever: Unrepentant techno, ambient excursions, live disco, hip-hop and a soul-house hybrid all took top honors this year and—looking over the scorecard—they were head-and-shoulders above even the rest of our top 20. With RA writers listing more than 250 full-lengths that they found worthy of your attention in 2008, we're not sure what that means exactly. All we do know is that these are our 20 favourite. You can nominate up to 15 albums AND/OR tracks. 15 tracks, 14 albums and 1 track, 3 tracks and 4 albums, 1 track, etc. Due date: please get your noms in before the new year. If it's datestamped with 2008 I will take it. Over the course of the next few day's we'll release, ten at a time, the albums that have squatted in, pulled, torn and unremittingly impressed our dainty little souls during the course of the year, and will probably do so for many more years to come. We count down our favorite tracks of the year, starting today with numbers 100-51, and concluding tomorrow with the next 50. Nominations will only be accepted until December 20th. Check out the list of nominations which are building up right here. Scan the list carefully to see if something you want to nominate has already been added or not. If you don't see something which you feel should be voted on, fill in the form at the bottom. Nominations will be screened before they are added to the list so be patient and do not add the same thing twice. Glasgow based festival: First 30 Hinterland Bands Announced - News - This Is Fake DIY - has revealed 30 bands confirmed to appear at the two-day event next April, 20 of which are Scottish. Global Underground will release Darren Emerson: GU36 Bogota on February 9th, 2009. Avant-garde extreme metal outfit COBALT has completed work on its highly anticipated new album, Gin, which will drop on March 17, 2009 via record label Profound Lore. The new album is expected on Artful/Fullfill early next year according to a statement on the label's website which says "Vini Reilly is in the studio as we speak putting the finishing touches to the album due for release in Feb. Whether it be DJing, producing or mental nursing, Danny Howells puts the utmost care into whatever he does. Better, not bigger, is his mantra. RA's Todd L. Burns talks to the man to find out more. Thrill Jockey will release Mountains new album Choral on February 16, 2009. The new New Violators album is due to be released February 23'rd 2009. Luke Turner salutes Wild Beasts, and in return they tell him about their plans for a new album early next year. By signing up for the Bandstocks website and paying a £10 fee, you can become a stakeholder in the lupine one's future success. Bargain! 05. Deerhunter: Microcastle / Weird Era Cont. 24. Nick Cave & the Bad Seeds: Dig, Lazarus, Dig!!! No 1: TV On the Radio - Dear Science: Critics poll 2008 | Music | guardian.co.uk - The Guardian have massive resources and all the can come up with is this uninspired top 10. Next: Later this week I will highlight some of the better 2008 lists from individual music bloggers. by:Larm, Scandinavia’s largest and most important music industry event/showcase festival, adds 55 vibrant and exciting acts to its roster. 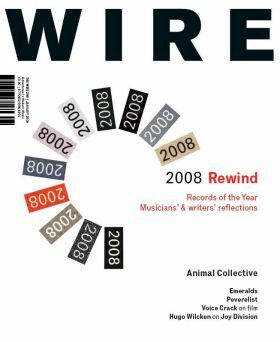 New issue of The Wire now on sale in the UK - Rewind 2008 it's a themed issue looking back on 2008 music. On The Cover: The Wire’s review of the year’s best music, including our Top 50 Records of the Year. Plus Animal Collective's Invisible Jukebox, Emeralds, Peverelist, Voice Crack on film, Hugo Wilcken on Joy Division and more.